Astronomers studying archival data from an Australian radio telescope have discovered a powerful, short-lived burst of radio waves that they say indicates an entirely new type of astronomical phenomenon. This burst appears to have originated from the distant Universe and may have been produced by an exotic event such as the collision of two neutron stars or the death throes of an evaporating black hole," said Duncan Lorimer, Assistant Professor of Physics at West Virginia University (WVU) and the National Radio Astronomy Observatory (NRAO). The research team led by Lorimer consists of Matthew Bailes of Swinburne University in Australia, Maura McLaughlin of WVU and NRAO, David Narkevic of WVU, and Fronefield Crawford of Franklin and Marshall College in Lancaster, Pennsylvania. The astronomers announced their findings in the September 27 issue of the online journal Science Express. The startling discovery came as WVU undergraduate student David Narkevic re-analyzed data from observations of the Small Magellanic Cloud made by the 210-foot Parkes radio telescope in Australia. 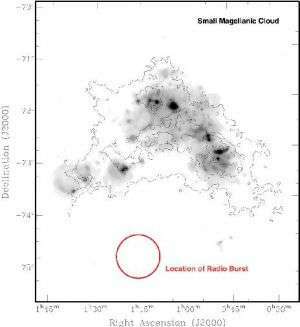 The data came from a survey of the Magellanic Clouds that included 480 hours of observations. "This survey had sought to discover new pulsars, and the data already had been searched for the type of pulsating signals they produce," Lorimer said. "We re-examined the data, looking for bursts that, unlike the usual ones from pulsars, are not periodic," he added. The survey had covered the Magellanic Clouds, a pair of small galaxies in orbit around our own Milky Way Galaxy. Some 200,000 light-years from Earth, the Magellanic Clouds are prominent features in the Southern sky. Ironically, the new discovery is not part of these galaxies, but rather is much more distant. "It was a bit of luck that the survey included some observations of the sky surrounding the clouds," Narkevic said. It was from those "flanking" observations that the mysterious radio burst appeared in the data. The burst of radio waves was strong by astronomical standards, but lasted less than five milliseconds. The signal was spread out, with higher frequencies arriving at the telescope before the lower frequencies. This effect, called dispersion, is caused by the signal passing through ionized gas in interstellar and intergalactic space. The amount of this dispersion, the astronomers said, indicates that the signal likely originated about three billion light-years from Earth. No previously-detected cosmic radio burst has the same set of characteristics. "This burst represents an entirely new astronomical phenomenon," Bailes said. The astronomers estimate on the basis of their results that hundreds of similar events should occur over the sky each day. "Few radio surveys have the necessary sensitivity to such short-duration bursts, which makes them notoriously difficult to detect with current instruments," added Crawford. The next generation of radio telescopes currently under development should be able to detect many of these bursts across the sky. Although the nature of the mysterious new object is unclear, the astronomers have some ideas of what may cause such a burst. One idea is that it may be part of the energy released when a pair of superdense neutron stars collide and merge. Such an event is thought by some scientists to be the cause of one type of gamma-ray burst, but the only radio emission seen so far from these has been from the long-lived "afterglow" that follows the original burst. Another, more exotic, candidate is a burst of energy from an evaporating black hole. Black holes, concentrations of mass so dense that not even light can escape their powerful gravity, can lose mass and energy through a process proposed by famed British physicist Stephen Hawking. The newly-discovered radio burst, the researchers said, might be the "last gasp" of a black hole as it finally evaporates completely. "We're actively looking for more of these powerful, short bursts, in other archival pulsar surveys, and hope to resolve the mystery of their origin," said McLaughlin. "In addition, if we can associate these events with galaxies of known distance, the radio dispersion we measure can be used as a powerful new way to determine the amount of material in intergalactic space," she added. The Parkes radio telescope is part of the Australia Telescope, which is funded by the Commonwealth of Australia for operation as a National Facility. The National Radio Astronomy Observatory is a facility of the National Science Foundation, operated under cooperative agreement by Associated Universities, Inc.